And that’s Jaipur. Sort of. 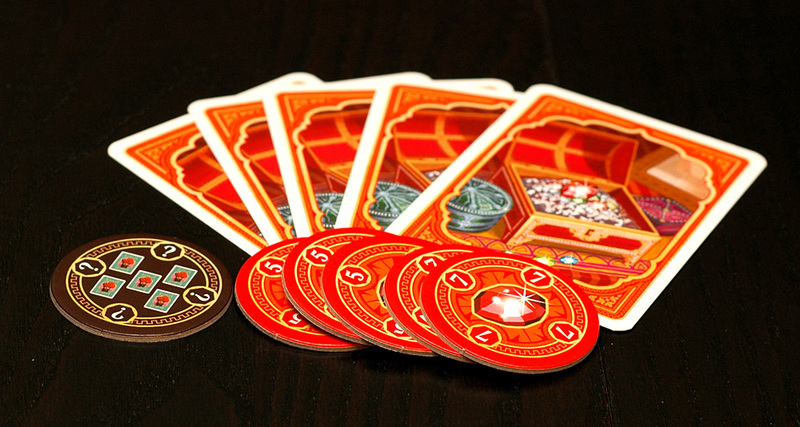 Jaipur is a relatively simple card game of set collecting, patience and just a smidgen of luck. The overall goal of the game is to be the best trader after you’ve seen a whole week’s (round’s) worth of the Market’s wares. If you manage to get the best goods at the end of the round and sell them for the most rupees, you are awarded a seal of excellence. The first player to be awarded two seals becomes the Maharaja’s personal trader and wins the game! Oh, camels. You vex me. To become the best trader, you have to survey and procure the best wares. There are several types of goods in Jaipur, represented by five cards that are revealed and always visible in the Market: diamonds, gold, silver, cloth, spice, leather, and the often-pesky camels. Diamonds, gold and silver are worth the most bonus rupees, but also have the fewest cards in the deck. 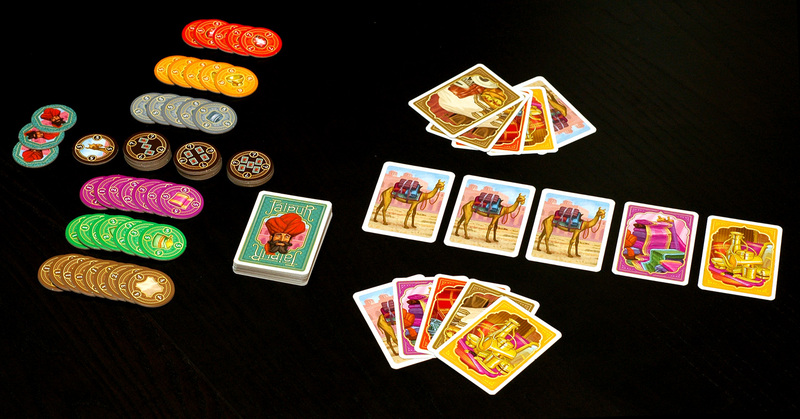 The camels are the most common, and generally worth the least – however, the player who collects the most camels in a round wins a bonus. It’s paltry, but sometimes it can make all the difference in determining a winner! Each round, a player can do one of two things: Take cards from the Market, or sell goods that the player already has in hand. Goods tokens are taken from front to back... so punks can steal the good ones while you wait for a bonus set. 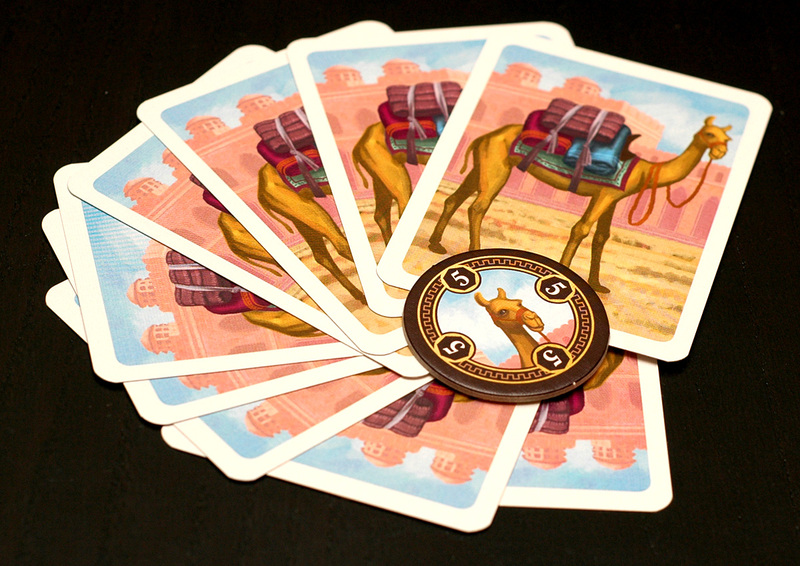 When players take cards from the Market they may either: Take one card, and replace that card with a card from the top of the deck; take several cards and replace each of those cards with cards they have in their hand; or take all the camels in the Market and replace those camels with cards from the top of the deck. Taking camels is risky as it may open good options for your opponent, but remember – he who has the most camels laughs last. Or something like that. A very nice - and very rare - occurrence. When players choose to sell goods in their hand, they place any number of goods of the same type in the discard pile. If the player sells three, four or five of the same goods at one time, the player also takes a corresponding bonus token. Each of these tokens are worth an unknown and random amount of rupees – determined on the back of the token – at the end of the round. The cheaper goods in the game can be sold off one at a time, but the more expensive goods – diamonds, gold and silver – may only be sold if the player discards two or more of them in the same round. A round ends when three types of goods tokens are depleted. The players turn over their goods tokens, count the number of rupees on the back, and the richest player is awarded a seal of excellence. Oh, and don’t forget to count camels – that player gets the camel token, which is worth five rupees, and really can win the game! I told you they can be pesky. Jaipur is incredibly easy to learn and, for the limited amount of actions you can take in a round, has surprising depth of choice. The real meat of the game lies in how long to hold onto your sets before cashing in; if you wait too long, your opponent may play one or two cards and take the goods tokens worth the most rupees. However, if you sell your goods too soon, you’re depriving your stash of quality bonus tokens. The decision can often be maddening - which is why the game, like many nerve- and adrenaline-fueled activities, is often addictive. While the addictive quality aids in replayability, there’s not much more to the game than what you get in the slim box, which can leave many experienced and hungry gamers eager for more. This game is far more gorgeous than it has any right to be. The colors and artwork are intense and immersive - this is easily the most beautiful card game in the Dice Hate Me collection. The card stock is perfect; weave-printed for just the right amount of texture and durability, with a slightly-wider profile than standard cards for easy handling. 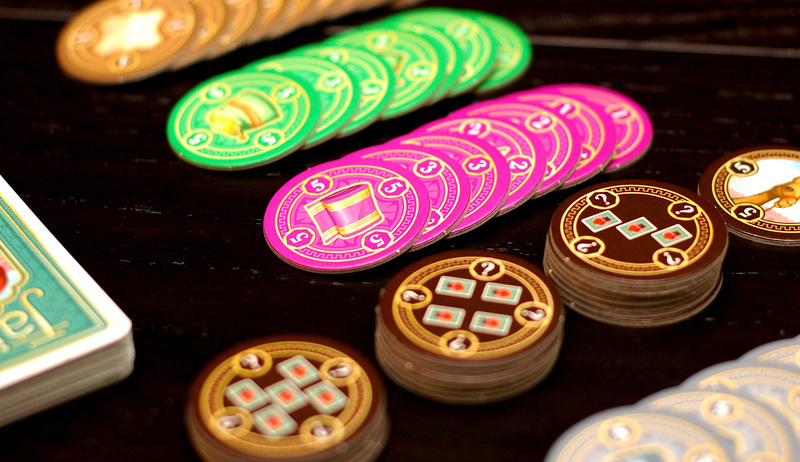 The goods tokens are printed on sturdy cardboard, and are larger than one might expect, which makes handling and rupee-counting oh so easy. This game is a joy to look at, touch and play. 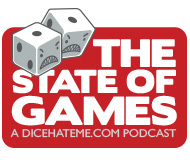 I almost wish I had a seven-sided die for this category. Jaipur - while sometimes frustrating because of the luck of the draw in the Market - is incredibly fun. Why? I honestly have no idea. There are some games that, if dissected, the parts would make most game scholars scratch their heads and utter a collective “huh?” However, put those parts together and a rare synergy occurs. This is the magic of Jaipur. Perhaps, like the crafty diamond merchant in our opening story, Jaipur is a gifted grifter, hoping to entice and hypnotize you with its blinding beauty and sparkling simplicity. Then again, I like to think of it much like the lowly camel - puzzling, temperamental, but uncharacteristically alluring and enduring. 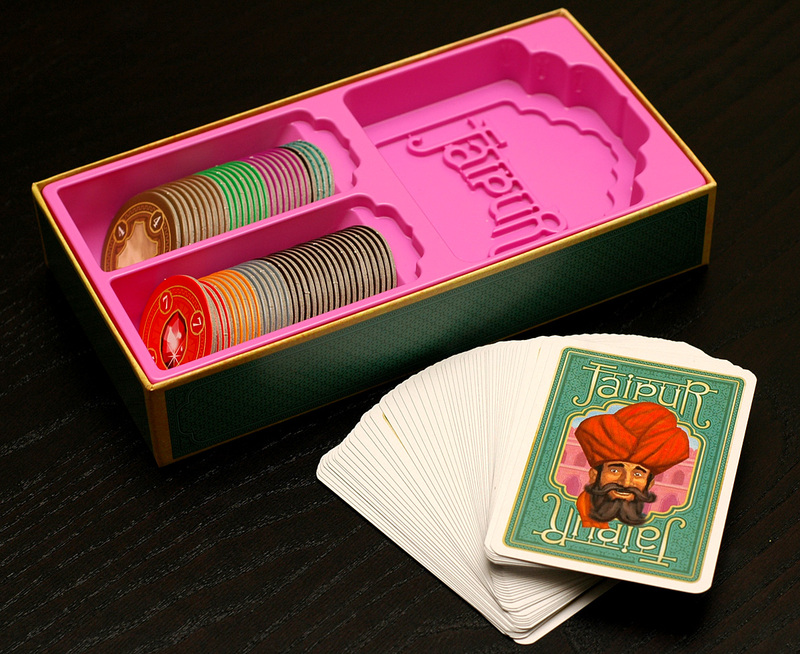 Overall score: 16 out of 18 - Buy, sell, trade; beg, borrow or steal - you need Jaipur in your collection. Seriously, look at the box insert! That is quality, right there. 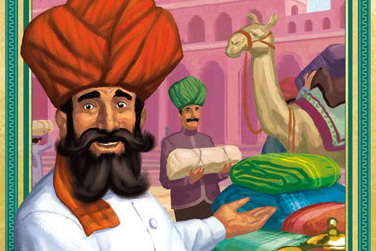 Jaipur is a game for 2 master traders, ages 12 and up, by Sébastien Pauchon from GameWorks. It retails for $19.99 from Funagain Games, or you can pick it up from your favorite local game store. My wife and I love Jaipur. It was the first success of Operation GamerWife. We still play it from time to time, and she regularly wollops me. GeekInsight – I’m pretty sure it was your review that put Jaipur on my radar to begin with! Jaipur just arrvied earlier this week and have played four games so far…Suprisingly, the Camel token comes into play more than you think…I would say 30-40 percent of the rounds I’ve played have come down to those extra five points…its a 10-point swing. Great game, great art, great fun! Definitely recommend it. Jim – I would totally agree – those camels can really swing a game! This is why they vex me.